The EPVMA developed the Annual Community Awards Banquet in 1986, and the El Paso Animal Hall of Fame in 1998, as methods of outreach to the many diverse animal groups in the region. Every May during National Pet Week for 33 years, hundreds of animal loving people from the general public and a wide array of animal organizations attend to support and recognize El Paso’s significant contributors to animal health and welfare. 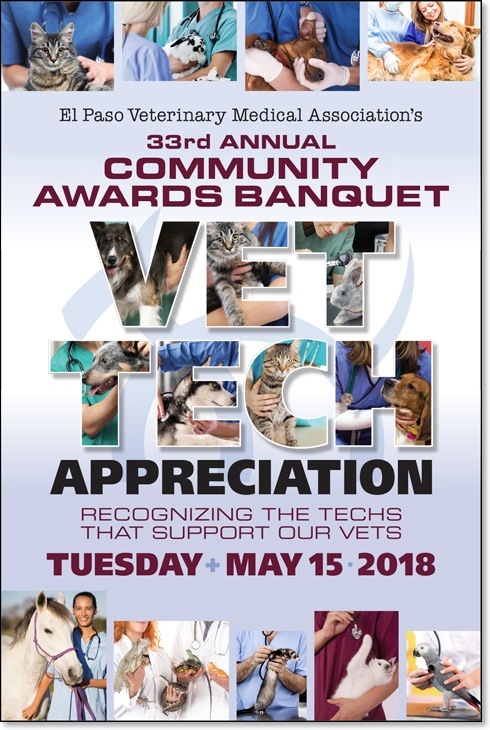 Recognized and awarded by the Texas Veterinary Medical Association (TVMA) as one of the most noteworthy veterinary public relations events in the state, this banquet creates enormous goodwill among all members of the animal industry. It helped lead to receiving the TVMA’s highest commendation, the “President’s Award,” for its innovative means of promoting unity within the field.